So for my birthday shindig, I gathered some friends and family and headed straight to the theaters for a grand time of Black Swan. Wow... just... wow. I love this movie. I do, I truly truly do. I walked out of the theaters feeling as if this movie was done for me specifically. This is the type of movie that I continually pray for as a fan of horror. And not just horror, psychological horror. A solid and engrossing story? Check. Performance? Check. Great direction? CHECK! From beginning to end I was totally engrossed in the story Darren Aronofsky was presenting of a shy and innocent young ballerina dancer named Nina as she struggled with the pressures of being pushed to play the dual role of the Queen Swan. Now, the overall themes and sub-text may have been done before and is nothing new, but the execution and the telling of the story of this particular character was just so very strong. While you can argue there's ambiguity and things to think about, there's a lot of things spelled out to you through implications and obvious symbolism, but seeing Portman's portrayal of an artist going mad for perfection of her craft while also raising into a state of confidence just refuses to let you go. I truly felt glee watching how well made this film was, especially as a film-maker who feels very dishearten with a lot of the current output of what passes as horror films. Thank you, Aronofsky. You're one of the few who comes out to prove to me that I can still proud call myself a fan of this genre in this day and age. The direction, the cinematography, the fantastic and beautiful sound mixing and the beautiful score! Jeez! If you don't know the premise for this film already, Nina Sayers is a dancer in a NYC ballet company. She's been dancing for quite some time now and although has been known for her dedication and being a fantastic dancer, she doesn't quite have that special spark that truly makes her stand out. When the director of the ballet company decides he's ready for a new production, Nina, much to surprise, gets picked the lead role of the Swan Queen. In playing the Swan Queen, she must both portray the White Swan, innocent and sweet and kind-hearted compared to the Black Swan, the evil twin sister who's conniving and devious and sexual. She fits the role of the White Swan to a perfect T, but she lacks any resemblance of the Black Swan. She's constantly being pushed and a target of insults and sexual harassment by her director, Thomas (played by Vincent Cassel, a growing favorite of mine) while having to deal with her overbearing and protective mother (Barbara Hershey). 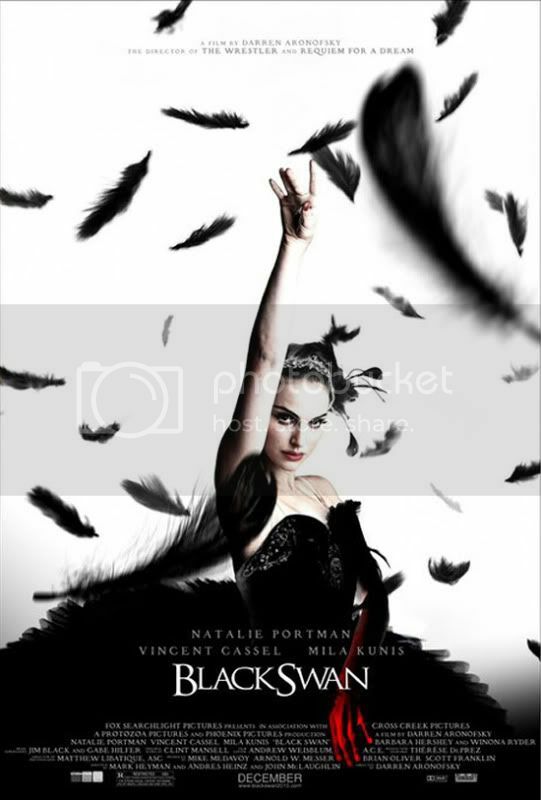 Of course her life doesn't become any easier when Lily (Mila Kunis) from San Francisco joins the company, a dancer who is impulsive, confident and in other words pretty much is the Black Swan and essentially threatens Nina's chances of being Swan Queen. Nina starts to obsess over being perfect and can't seem to grasp a hold of her reality. Things go crazy and we're not sure if anything is what it seems. I had so many favorite parts and aspects of this film that it really is hard for me to pick one defining part. I actually found it surprising some criticism I've heard of the movie walking out with some friends and family as we all discussed the film. A lot of the discussion I would post here, but I truly don't want to spoil this movie at all. Just go and see it and have a grand time of fine directing.